The new Lily Relax 2-Seater Bench is an addition to the ergonomically designed Lily Relax range, featuring smooth curves and Deco-style, fanned seat backs. 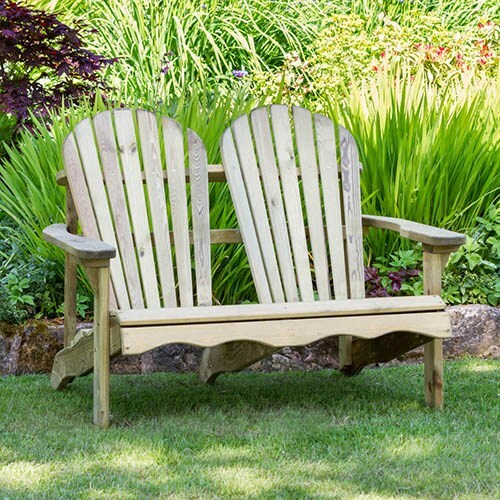 Designed with both comfort and style in mind, it features wide arm rests, lower seat height and angled back rest, it is made for total relaxation, while providing a unique perspective on your garden. Put your feet up with the matching foot-stool and don’t forget the matching side table, perfect for refreshments. The Lily Relax 2-Seater Bench is manufactured from high quality, pressure treated, FSC® Certified timber to last longer, and comes with 10-year guarantee against rot so you can be sure that this product will last the test of time and remain a beautiful feature in your garden. Dimensions: 1.22m x 0.93m x 0.92m, assembly required - This product is 2-person assembly.